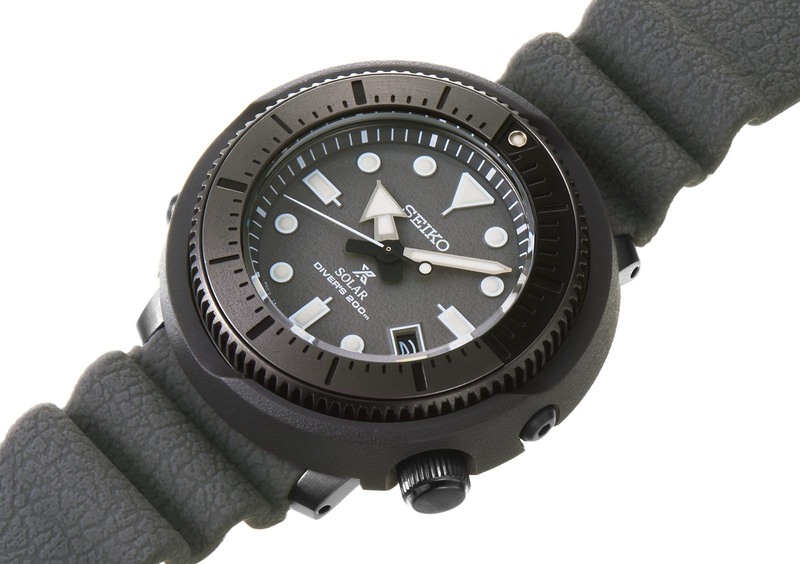 Nicknamed after its chunky, round case (which made for a droll April Fool’s), the original Seiko “Tuna” of 1975 is perhaps one of the most uncompromising dive watches ever created. Despite having been conceived for professional saturation divers, it has since spawned numerous, 200m “Baby Tuna” variations destined for terra firma, including the new Prospex ‘Street Series’ created with young urbanites in mind and, typical of a current fad, sold exclusively online. Featuring solar-powered quartz movements, the Prospex Solar Diver ‘Street Series’ is essentially a “Baby Tuna” in olive, grey or blue, paired with a textured silicone strap. The original Seiko Professional 600m ref. 6159-7010 – designed by noted Seiko engineer Ikuo Tokunaga – notched up several world-firsts, including a monocoque titanium case and a protective ceramic shroud, or outer case. It also relied on a patented L-shaped gasket to eliminate the need for a helium escape valve. The ‘Street Series’ retains the same look and robustness, but does away with the professional features. Measuring 47mm wide and 12mm in height, the case wears considerably smaller due to its short lugs. 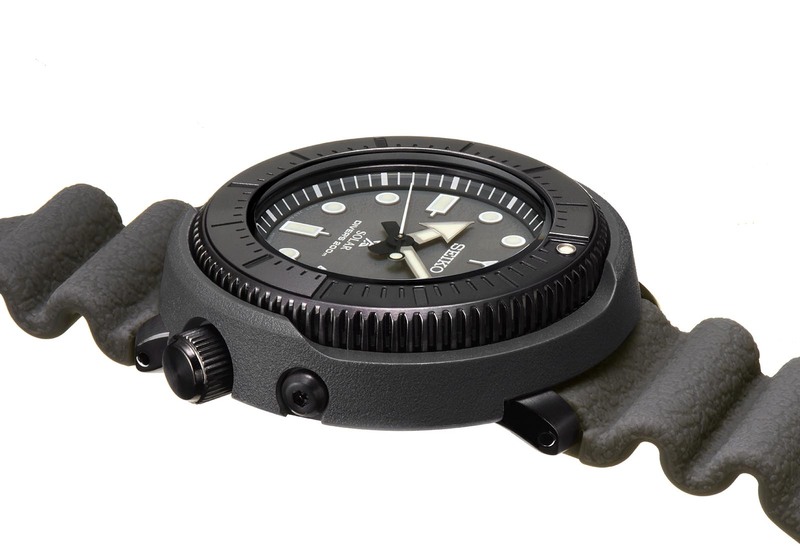 Unlike the high-end “Tuna” dive watches that have ceramic or composite shrouds, this utilises a plastic shroud. Though its massive profile means it makes a statement on the wrist, the ‘Street Series’ adopts a muted aesthetic, taking the visual impact down a notch. 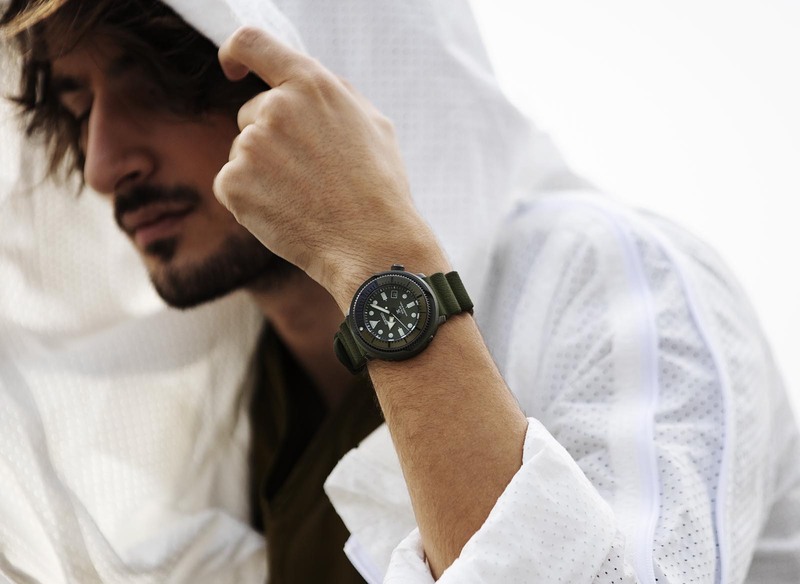 Its inner steel case is black-coated while the plastic shroud has a grained, matte finish in the same colour as the bezel. Both the silicone strap and dial are textured to evoke unfinished concrete. And the elapsed time bezel has been reduced to just baton markers, with the first 15 minutes of the bezel being recessed, sitting one level down. The ‘Street Series’ is fitted with Seiko’s proprietary Hardlex crystal (mineral glass with a hard coating) and are water-resistant to 200m. Inside is the cal. V157 Solar Quartz movement that harnesses solar energy in order to recharge the battery. When fully charged, it will run for up to 10 months. 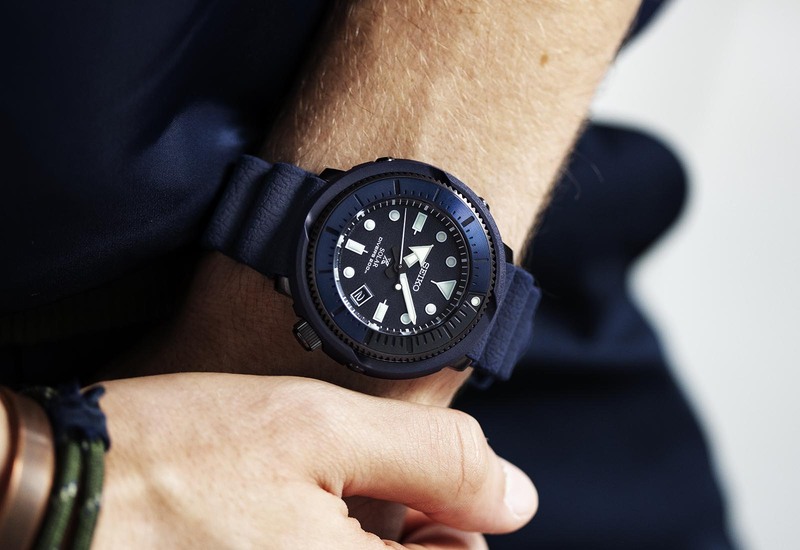 The Seiko Prospex ‘Street Series’ Solar Diver is available in navy (ref. SNE533), olive (ref. SNE535) and grey (ref. SNE537), priced at US$450 each. It’s available at Seiko boutiques and retailers in most countries, and in the United States it is only available online at seikousa.com. Correction December 29, 2018: Availability varies according to country. 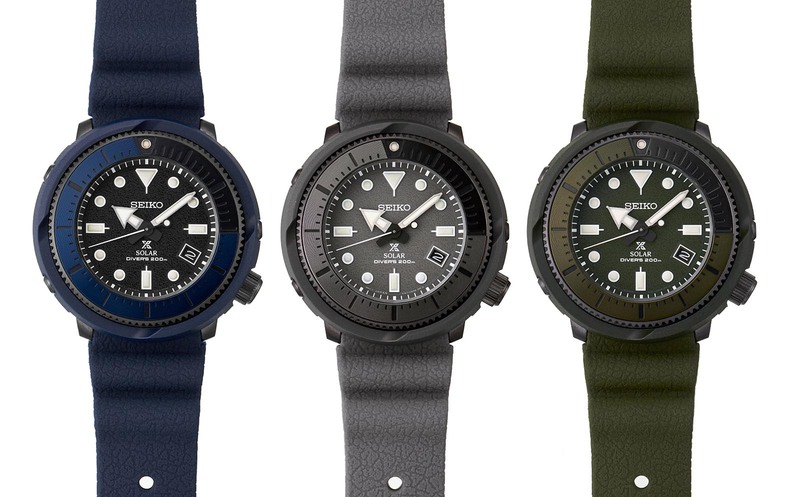 A remake of Seiko's first 300m dive watch. 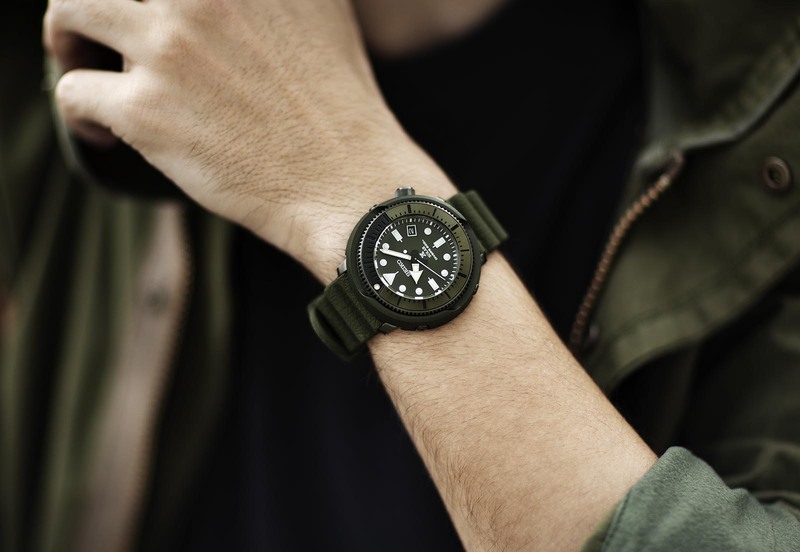 Inspired by old school military issue dive watches.